Summary: An ASEAN''''''''s manufacturing and supporting industries are growing rapidly, so do the demand for precision electronics parts and components. 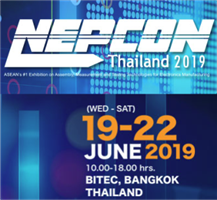 NEPCON Thailand 2018 will be the destination for 10,000 electronics industrialists to discover the right technology, the right business connections and the right know-how that will energize the community''''''''s productivity and potentials throughout ASEAN. 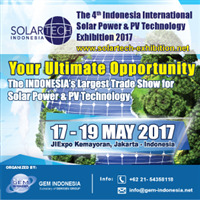 Summary: Reflecting big success in Solartech Indonesia 2016, the 4th edition of Solartech Indonesia 2017 which will be held on 17-19 May 2017 at JIExpo Kemayoran, Jakarta - Indonesia will be expanded up to 35% of exhibition area. The exhibition which is in conjunction with INALIGHT, PowerGen & Renewable Energy Indonesia, Battery Indonesia, INATRONiCS, and Cable & Wire Indonesia 2017 is expected to be one of the ASEAN’s most prospective one-stop exhibition. It is an event not to be missed. Summary: Today, Engineering, Procurement and Construction (EPC) projects are uniquely challenging. Parties currently involved in large complex and fast-track EPC projects frequently suffer financial loss that could have been mitigated by effective contract management. 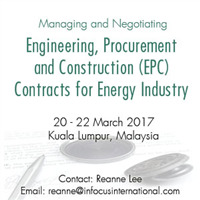 In this 3-day workshop, you will analyse an EPC contract, clause by clause, focusing on your challenges in international and domestic projects. This unique interactive master class discusses the key issues in EPC contracts. 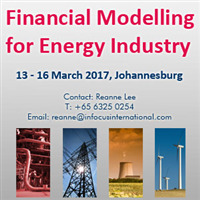 Summary: This course is to help delegates build a financial model to best practice standards for project finance. You will step through developing a model: handling inputs, building detailed calculations and creating final outputs; learn how to sensitise the model to understand how changes in assumptions affect the business results and viability. In 4 days, you will learn modeling techniques and develop a framework for recognizing and analysing qualitative and quantitative risks. Title: HANNOVER MESSE 2017 (24–28 April, Mon.–Fri. ): A t a g l a n c e ! Summary: HANNOVER MESSE 2017 (24–28 April; Hannover, Germany) unites seven trade fairs at the Hannover Exhibition Center: Industrial Automation, MDA–Motion, Drive& Automation, Digital Factory, Energy, ComVac, Industrial Supply, and Research & Technology. Roughly 6,500 companies from 70 countries present their products and services to more than 200,000 visitors from 80 countries. Poland is Partner Country in 2017. Title: Big Vision without Execution Plan is just a Wishful Thinking! Summary: You have a big vision and great strategy for ambitious growth. 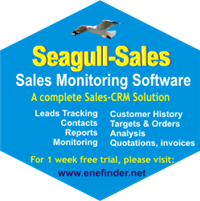 You wish to take your business to double the sales turnover in just two years, but have no means for monitoring the activities that will execute your plan successfully. The end result in such a case can be anybody’s guess! 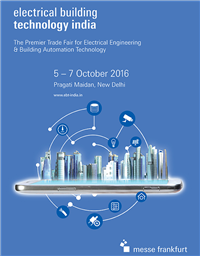 Title: Electrical Building Technology India to bring over 250 companies to showcase smart city solutions. Summary: Light India, and Electrical Building Technology India will concurrently open their doors from 5 – 7 October 2016 in New Delhi. The first edition of the two unified events is expected to bring over 250 companies to New Delhi to showcase solutions for smart cities. Targeting the most important visitor groups and policy makers, the co-located fairs will take place at Pragati Maidan in the nation’s capital.